Finding a caterer was my main focus in February. We have 5 catering companies lined up to meet with, and so far Scott and I have met with 2. Honestly, I thought bringing in everything ourselves to the venue would get kind of stressful. I’m slowly learning to take some deep breaths, take one step at a time, and in doing so I’m really enjoy this entire process of putting every single piece of our dream wedding puzzle together. To start off our update here’s a breakdown of each company we’ve met with so far. Millenia Catering is located within 10 minutes from our venue and has a more of a modern look. We really LOVED the owner, Chef Lo. This company is definitely a smaller company, but has had plenty of experience catering a variety of events, including at our venue, Heaven. Although Millenia is smaller, Chef focuses on one event a day and overseas everything that ends up at the event himself. What we liked right away is that he sensed that we were creative people who wanted something different and out of the ordinary for our guests. We want our reception to be fun, and for people to remember some things about our food selections and set-up. He was very sincere about tables, chairs and linens – and it looks like it would be more cost effective for us to outsource those. He actually suggested meeting with other caterers to find out if he’s exactly what we were looking for, so we appreciated his honesty. Overall, we were very impressed by how much he could do for us and it seems like the pricing is right. I guess the official proposal will tell. My mom and I going over different options with Chef Lo. Scott my mom going over linen choices. Arthurs is located about 30 minutes from venue, but is more of a mega-company. Their experience is very impressive and they can handle several parties or weddings in one day. 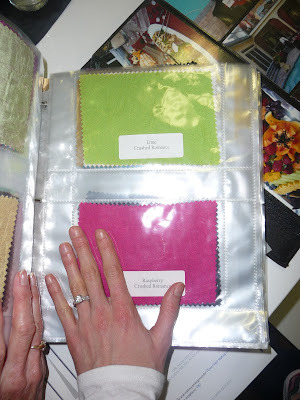 We met with the Event Designer, Lori and we loved all of her ideas. One thing in particular I loved about her was that we didn’t just talk about food. Of course food is the main topic in a catering meeting…but she made it just as important to talk about the look of and theme of our wedding. She was very familiar with our venue and even showed us examples of a floor plan she made for tables and chairs to map everything out. She suggested an alternative to a sit down dinner, and something different from just food stations – which we LOVED! Who would have thought there were more options? We looked at tons of pictures and I have to say that their menu is a bit overwhelming. The possibilities of dishes seem endless, which could be a great thing, or just add more stress at what to choose. All in all, I was very impressed as well with Arthurs, and I know already that choosing a catering company will be a very hard decision for us. Fortunately, the whole budget thing will come into play and help narrow this down. I have to admit I went into the meeting thinking, “Holy crap, we will never be able to afford THIS much to be going on in order to have what we want,” but when Lori showed us a completely rough estimate, it actually seemed doable! Again, the official proposal will help us out a lot to see what we can work with. Scott is looking over the photos, sipping coffee. How fancy! LOVED some of their unique displays for appetizers! Impressive set up for catering tables and chairs. So, this whole catering thing isn’t as scary or confusing as I thought…I’m so glad we have a few meetings under our belts and that we can now meet with the remaining 3 companies to see who fits us best for the best price. Hopefully we can start narrowing what we like down to one or two by the end of the 5 meetings, and go from there. Can’t wait to go back to these companies for meeting #2 – that will include some tastings! I think hiring a catering company is a great way to ensure people will like the food. People usually feel safer eating catered food, as well, because they feel there’s more chance sanitary procedures were used in its preparation.